Create a lovely garden feature and add instant colour with a decorative hanging basket. We have a wonderful range which combines elegant and traditional styles. Matching rose design hanging basket and wall bracket are both the same design. Made from iron with a cream finish. Rose and leaf design on both the hanging basket and wall bracket. hanigng basket comes with liner and chains. Basket: 35cm diameter by 16cm high. Wall Bracket: 30cm high by 31cm wide. Nature design hanging basket and bracket made from iron with bronze paint finish. . Complete with liner and chains. Size of basket 35cm diameter x 16cm high. Size of wall bracket 30cm high x 35cm wide. 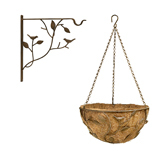 Heavy duty iron construction hanging basket with a decorative design with add scrolls. Comes complete with heavy duty chains and basket liner. Strong flower hanging baskets with black chains for hanging from brackets or hooks. Manufactured from steel strips with powder black coating to protect from rust. This garden hanging basket come with coco fibre plant liner. These old English baskets are a traditional wire metal hanging basket. These garden hanging baskets have strong galvanised chains with no-tangle S-hook attachments. These wire hanging baskets are ideal for lining with moss. This basket does not include a liner. These old English baskets are a traditional wire metal hanging basket. These garden hanging baskets have strong galvanised chains with no-tangle S-hook attachments. These wire hanging baskets are ideal for lining with moss. Complete with Co-co liner. These old English baskets are a traditional wire metal hanging basket. These garden hanging baskets have strong galvanised chains with no-tangle S-hook attachments. These wire hanging baskets are ideal for lining with moss. Comes complete with Co-co liner. These gothic style garden hanging baskets are made from strong wire in distinctive arched style. All these plant window boxes have deep baskets for better plant growth. These hanging baskets come complete with a quality Co-co liner. This window box has a black epoxy finish. Flat bottom hangiing basket. These wrought iron hanging baskets are manufactured from heavy duty steel. The flower baskets are powder coated for long lasting looks with strong robust construction. The plant hanging baskets feature a decorative spiral at the bottom of the basket with detachable hanging arms. Brackets for hanging baskets and hanging basket liners are available seperately. This wrought iron hanging basket is engineered to the finest standards. These hanging flower baskets feature hammered finish rims and decorative twisted front bars. A hanging basket liner is included with the flower basket along with the black matching chain. Brackets for hanging baskets are available seperately. These metal hanging baskets compliment all window boxes and hayracks in the range. These plant hanging baskets measure 12" (30cm). These hanging flower baskets feature hammered finish rims with spiral design. These metal hanging baskets compliment all window boxes and hayracks in the range in the range. Made in Great Britain. Reduce your carbon footprint by British. These plant hanging baskets measure 16" (40cm). These plant hanging baskets measure 14" (35cm). 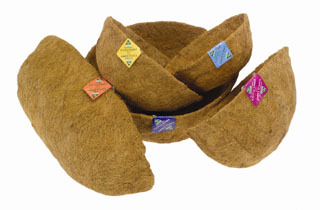 The Georgian flower hanging basket range comes with a quality co-co hanging basket liner. The wrought iron hanging baskets are made from heavy gauge rod and steel strip throughout. Durable black wrought iron crackle finish will compliment all window boxes and hayracks. These plant hanging baskets measure 18" (45cm) diameter. These plant hanging baskets measures 18" (45cm) diameter. The wrought iron hanging baskets are made from Solid rod and square section construction. The flower hanging baskets have distinctive barley twist decoration. Strong welded joints. Matching black chains with 4 point linkages. Tough epoxy (not plastic) coating for durability and the wrought iron look. A hanging basket liner is included with the flower basket. These metal hanging baskets compliment all window boxes and hayracks in the rangeality liner included. These plant hanging baskets measures 16" (40cm) diameter. Strong welded joints. Matching black chains. These plant hanging baskets measures 14" (35cm) diameter. Lattice design hanging basket manufactured from heavy duty wire with a rust effect finish to with stand weather conditions. All joints are hand-welded for maxiimum strength. Flower hanging basket comes with chains and good quality plant liner. These hanging basket tree adds height and colour like nothing else. This hanging basket tree is sturdy and staple. This basket tree comes complete with four hanging baskets with quality Co-co liners. 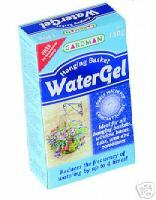 An essential ingredient for all hanging baskets, planters, tubs and window boxes. Reduces watering by upto 4 times. Improves plant quality and flower production. Improves productivity of dry soils. The crystals absorb several hundred times their own weight. Easy to mix into compost. Wall brackets from only £1.99. Click on image to see full range of basket liners.